Another quick post as I find myself falling behind in other endeavours. Also, I hadn’t checked for a while and hadn’t noticed a jump in followers. I hadn’t noticed is because my daily visits remain about the same and — if anything — the numbers of visitors have dropped. Certainly, the comments have dropped. In the interest of keeping this short, I figure I would introduce myself to new subscribers (who, likely, will never visit again). You can read a fair amount about me in THIS post. 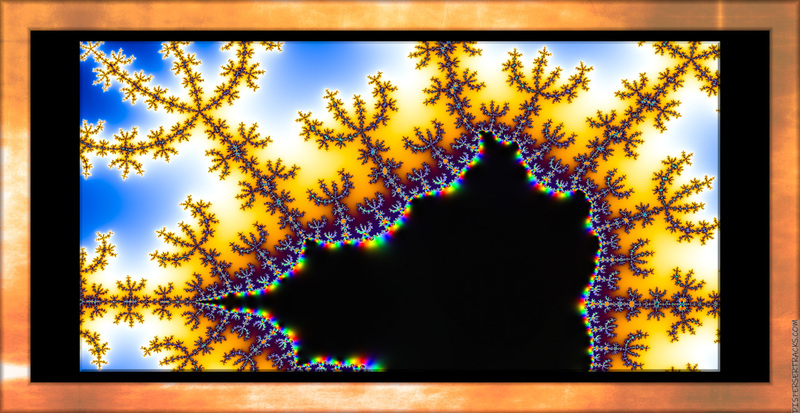 This is more like an actual fractal solution to one of the sets. Again, I’ll probably do a post about fractals and apps and stuff. There’s a lot of ink visible here in Kona. It’s rare to pass someone without at least a small tattoo and some people carry designs spread across multiple square feet of skin. I don’t understand the attraction especially given the cost.
. . . I would prefer making a mark on the world than the other way around . . .
As I mentioned in the previous post, the folding of space and time using String Theory can be visualized 2-Dimensionally but we can also show the variations occurring when you ship it in a batch . . . The Fifth Dimension Packaged For Shipping — Batch One. Some of these posts will likely be longer as the mood hits me, but most will be thus; short, uninteresting, bland, and relentless. You can read about Project 313 HERE. PHOTO: For some reason it reminds me of the inside of a geode…so beautiful! CARTOON: HA! And true dat on what you said! DOODLE: Love this! I love the ones that have a chalk-y feel! Come to think of it, yes it does. As chance would have it, I just recently photographed a few geodes at a museum in Hilo. I’ll be posting those sometime. Maybe even soon, who knows. There was a “rock hound” man in our neighborhood when I was a kid and we liked going to see all of his rock collection and especially the geodes. I hadn’t thought about them for a long time and your photo reminded me of them. HUGS!!! to you and Melisa!!! Your doodle reminds me of Palmanova (wish I were there) and would make a great design for a rug. I say rug because your processing has a felt/wool look to it.